BODY COLOR 3-PIECE HARD TOP If ordering without AEM (Dual Top Group), the black soft top will not be included, Rear Window Defroster, Delete Sunrider Soft Top, Freedom Panel Storage Bag, Rear Window Wiper/Washer, TRANSMISSION: 5-SPEED AUTOMATIC (W5A580) Hill Descent Control, Tip Start, RADIO: UCONNECT 430N CD/DVD/MP3/HDD/NAV SIRIUSXM Travel Link, 6.5" Touch Screen Display, GPS Navigation, 40GB Hard Drive w/28GB Available, Remote USB Port, AIR CONDITIONING W/AUTO TEMP CONTROL Air Filtering, ANTI-SPIN DIFFERENTIAL REAR AXLE, TRAILER TOW GROUP Class II Receiver Hitch, Trailer Tow w/4-Pin Connector Wiring, ENGINE: 3.6L V6 24V VVT (STD). 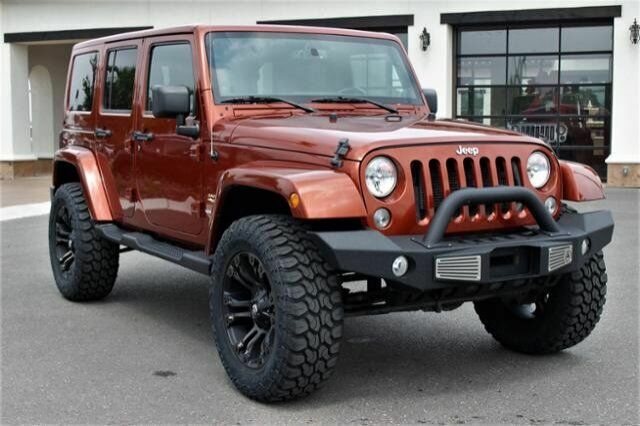 Edmunds.com explains "The 2014 Jeep Wrangler is a no-nonsense vehicle that's at its best when the pavement ends. This classic SUV will climb over rocks, cross streams and frolic in the sand dunes whenever you please, thanks to its standard four-wheel drive and high ground clearance. ".